Pauline Brasch lives in Melbourne, Australia, with her husband, two children and two cats. She loves art, computers, books and children (oh, and cats!)... and is very grateful to her husband for explaining pixels. Maddie and Samantha have a whimsical conversation about how rainbows might be made... But wonder and happiness are not external to us. To make this rainbow, the magic is not only in the elements, the secret ingredients include our attitude to life and our own perspective. A charmingly illustrated children's picture book with simple rhyming text to encourage young readers with a positive message about life. Moon Ghosties are messy and mannerless... but they have lots of fun. Miss Etti Kett is neat and nice... but rather glum. But if they each give in a little toward the other, they can get along without all the bother! A fun tale about ghostly compromise for 3-6 year olds. 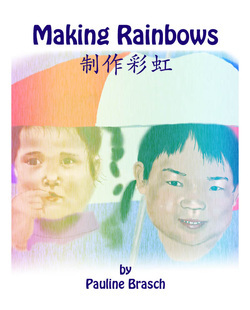 Colourful pictures, engaging characters and humorous rhyme. A great bedtime story. •Miss Etti Kett: Very neat and nice and always well mannered. •Biff: Zooms around on shooting stars. He's the epitome of the wild child! •Eddie: Billiard player extraordinaire, but practices on the wrong targets. •Fred and Ginger: What can I say... they dance. 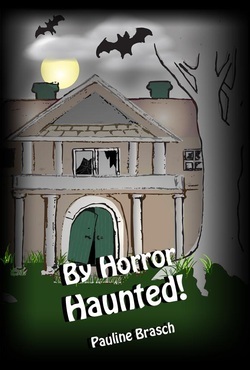 A children's illustrated early reader, By Horror Haunted! is based on Edgar Allan Poe's "The Raven" in rhyme and meter, demonstrating how these techniques can build atmosphere in a text. On a cold, bleak day, Adam and Drew are bored! Sent off outside by their frazzled mother, they wander down the street past the empty, unfriendly house on the corner. Is it haunted? Or is it all perception? Reprints Edgar Allan Poe's "The Raven" as an epilogue. 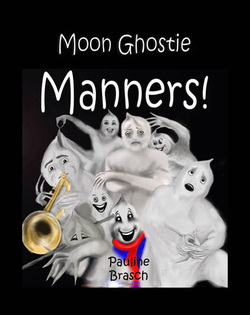 Book #2 of the Moon Ghosties deals with what really happened when man landed on the moon! 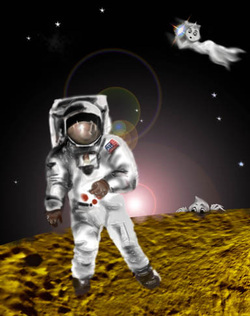 See what happens when astronauts land on the moon and the Ghosties deal with these men in spacesuits!